Brought to you by Taylor's Bespoke Silicon Group. See bsg_manycore bitbucket git repo. BaseJump FPGA Bridge as well. See our Quickstart guide for using Celerity, the open source 511-core chip. 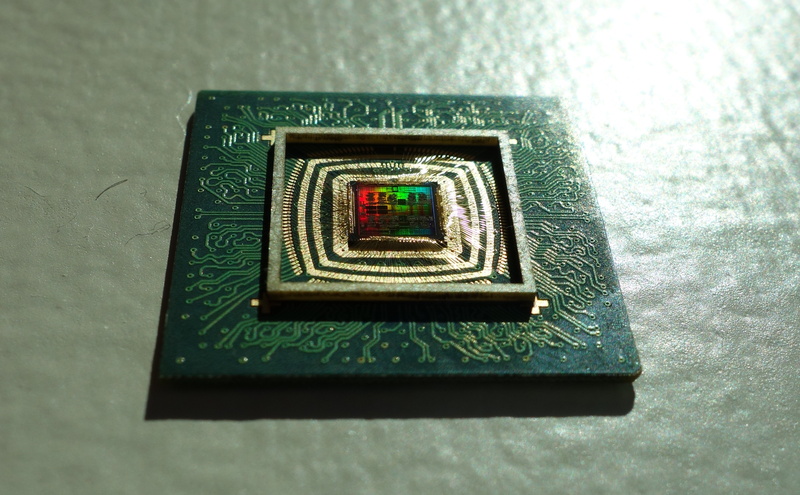 Celerity: An Open Source RISC-V Tiered Accelerator Fabric. Tutu Ajayi, Khalid Al-Hawaj, Aporva Amarnath, Steve Dai, Scott Davidson, Paul Gao, Gai Liu, Atieh Lotfi, Julian Puscar, Anuj Rao, Austin Rovinski, Loai Salem, Ningxiao Sun, Christopher Torng, Luis Vega, Bandhav Veluri, Xiaoyang Wang, Shaolin Xie, Chun Zhao, Ritchie Zhao, Christopher Batten, Ronald G. Dreslinski, Ian Galton, Rajesh K. Gupta, Patrick P. Mercier, Mani Srivastava, Michael Bedford Taylor and Zhiru Zhang. Tutu Ajayi, Khalid Al-Hawaj, Aporva Amarnath, Steve Dai, Scott Davidson, Paul Gao, Gai Liu, Anuj Rao, Austin Rovinski, Loai Salem, Ningxiao Sun, Christopher Torng, Luis Vega, Bandhav Veluri, Xiaoyang Wang, Shaolin Xie, Chun Zhao, Ritchie Zhao, Christopher Batten, Ronald G. Dreslinski, Rajesh K. Gupta, Michael Bedford Taylor and Zhiru Zhang. Has more details on the open source code for Celerity. The BaseJump Manycore Accelerator Network. Shaolin Xie and Michael Bedford Taylor. Published on arxiv.org. August 1, 2018. Contact prof.taylor@gmail.com for more details. We are looking for collaborators who are excited about developing programming methodologies for manycore chips! 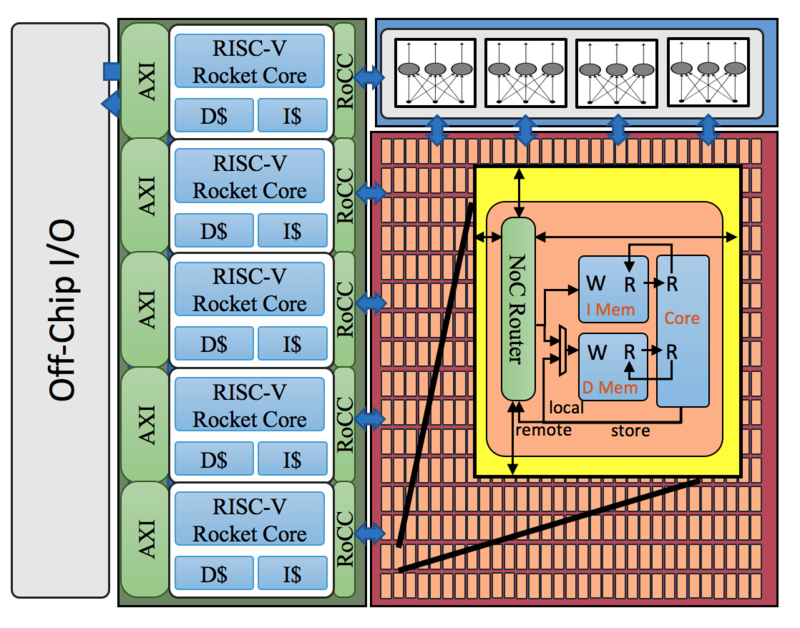 Celerity couples the 1 GHz 496-core BaseJump Manycore array to 5 Rocket cores via independent RoCC links. It also has a neural network accelerator with multiple connections to the manycore. The manycore can do stores that traverse across the mesh and write directly into the neural network state. The daughterboard in the picture on the above right is the Celerity system running. The Zedboard on the right provides DRAM and ethernet connectivity. Die photos and layouts will be released after publication in a circuits conference. Taylor BSG teammembers (Scott Davidson, Chun Zhao, Shaolin Xie and Michael Taylor) have also taped out a 10-core manycore in TSMC 180 (commit_tag). This chip multiplexes the the south side of the manycore directly to the off-chip I/O interface using the T block. An FPGA can be used to extend the manycore in the south direction, or alternatively you can couple the manycore to a processor inside an FPGA. Click here for zoomed-in photos of the chip. 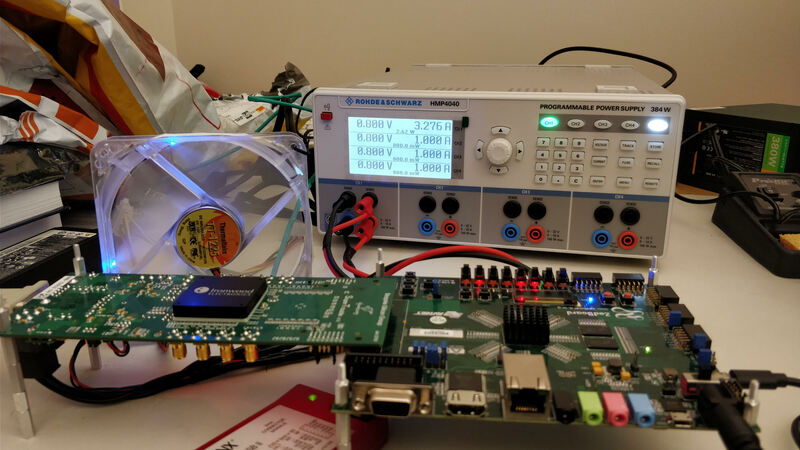 Our High-Speed Singled-Ended DDR I/O (using off-the-shelf 3.3V TTL) has been confirmed to work at ~390 MHz with 16mA outputs.